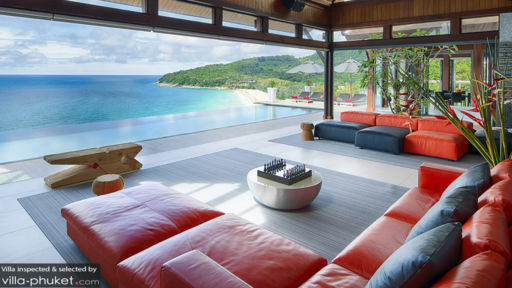 The Malaiwana Estate is a swanky new property on the island of Phuket facing the Andaman Sea and Nai Thon, sitting amidst other luxurious properties and offering its guests state-of-the-art services in living/dining/accommodation. The five-bedroom luxury private holiday home is perfect for those seeking a peaceful and classy vacation spot for the best tropical adventure of a lifetime. With an infinity-edge salt-water pool and a large surrounding pool deck housing a lounge with DJ and surround sound system, you couldn’t ask for more! The luxurious master bedroom with a grand entrance is located on the main living floor, with a similarly awe-inspiring view of the sea and direct access to the swimming pool. A walk-in closet greets you as you enter the room with ample space to store all your belongings. The room is furnished with a king-sized bed and is joined by an en-suite bathroom as well. The TV comes with an integrated sound system as Villa M is high on entertainment and having a good time! The five bedrooms at the villa are located on the lower floor, which also houses the gym and games room that houses a pool table. Four bedrooms are furnished with king-sized beds, while one bedroom is having two single beds and they are joined by en-suite bathrooms. Each bedroom has a private balcony with mesmerizing views that you get to bask in endlessly for hours! The gorgeous view of the Andaman sea and neighbouring beaches of Phuket mark the periphery of Villa M. The infinity-edge salt-water pool resides just outside the living area, and merges with the scenic beauty of Nai Thon. 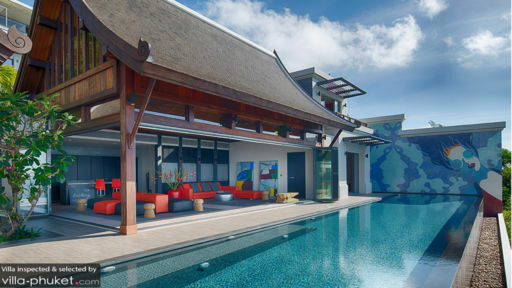 The expansive pool deck houses several sun chairs with large umbrellas that you can use to lounge and relax on after a rejuvenating swim, while you enjoy the breathtaking view. Surrounded by natural greenery accentuates and enhances the tropical experience, and as you observe the clear-blue skies reflected on the surface of the pool, you will feel yourself relaxing in the paradise that is Phuket! The sprawling living area runs the length of the infinity-edge pool and is essentially an open-plan architecture owing to bi-fold doors that give makes it more spacious and airy. The well-furnished and contemporary living room is styled in a modern fashion with designer lights and artwork. The orange-coloured couches and leather sitting area adds more oomph and sass to the room, yet maintaining its comfortable and inviting ambiance. Overlooking the spectacular Andaman Sea, the living area is the best place for you to spend time in. The dining area and kitchen also form part of the living space with a large dining table and a fully-equipped modern kitchen at the end of the room. The kitchen has an island top and barstools where you can enjoy drinks as you take in the glorious view. There is a separate Sala which houses the lounge area. It is furnished with a sunken dining table and a DJ turntable, so you get to enjoy and have a blast, what else are holidays for! A multi-purpose gym equipped with all the fitness machines and equipment is also accessible to the guests. Another room functions as the media room with super luxurious and comfy L-shaped sofa and a massive flat-screen! While the villa offers many amenities and services, there is a dedicated and kind staff to ensure your stay is memorable. A villa manager, maid and a Thai chef are at your service. The rooms have electrically-operated blinds for your convenience and the entire villa is wired with internet access. 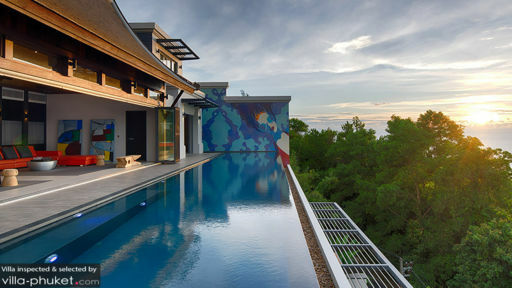 Villa M is located in the quiet and serene area of Nai Thon on the island of Phuket and given its location next to other popular hotels, there are several excellent restaurants and bars that offer delectable cuisines to the guests.